4320 Flagship Court. Welcome to this open and bright home situated in desirable area of Las Vegas just moments away from the world class entertainment, dining and shopping of the Fabulous Las Vegas Strip. Iron gated entry with decorator glass doors leads to this comfortable single-story home featuring 3 bedrooms and spacious living areas. Kitchen flows seamlessly into the family room with fireplace creating an ideal space for relaxing or entertaining. The kitchen offers many extras including white tile counter tops, quality cabinetry, garden window, built in appliances, island with sink, and a breakfast bar as well as a nook with window seat. Family room is highlighted by a set of French doors opening to the patio. Relaxing master suite boasts patio access as well as a beautiful bathroom treated with pillars, jetted spa tub, and walk-in shower. 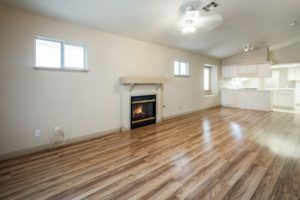 This home is complemented volume ceilings, art shelves, hardwood laminate floors, and ceiling fans. Covered patio and a tough shed.